Lock in your Cybersecurity Skills. Learn to describe the current enterprise security landscape, define the Assume Compromise approach, practice red team versus blue team exercises, and develop organizational security preparation, processes, and responses. In Security in Office 365®, you will learn how to plan, implement, and manage the security features of Office 365 in your organization. The Security and compliance center in Office 365 offers a wide variety of security features to protect your users and data in Office 365. In this course, join the experts for a look at user authentication—who the users are—and authorization—what they are allowed to do. Plus, find out about auditing system access and data encryption, to make sure your data is properly secured. In Microsoft SharePoint 2016 Authentication and Security, you will learn how to plan and configure a SharePoint on premise solution for a variety of authentication levels and security requirements to help protect the environment. 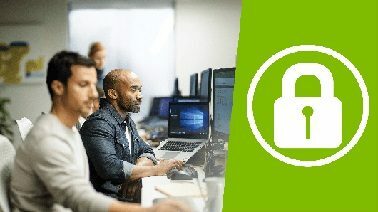 You will learn Azure security best practice and understand the terminology, tools, and techniques for creating a secure resilient cloud service. You will also learn about and use the additional security services offered in Azure and Intune. The Microsoft Professional Capstone in Cybersecurity provides a simulated environment at a fictitious company that you must protect by detecting and responding to a cyberthreat. Booking Options: We offer two options to reach your Certificate in Cybersecurity! Do you have any questions about the Microsoft Professional Program for Cybersecurity? You can reach us any time at +49 40 253346-10 or send an email to info@flane.de.